Yardie Creek Boat Tours (YCBT) offers a leisurely, relaxing and eco-friendly one (1) hour boat cruise along Yardie Creek, aboard our safe, comfortable and well shaded vessel "Yardi". 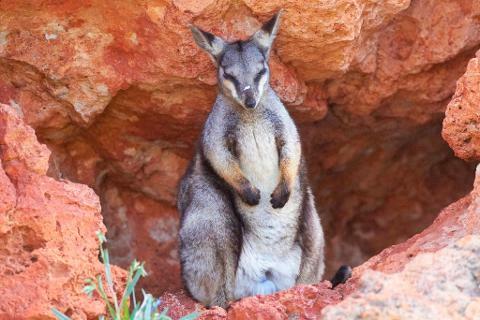 Learn what makes Yardie Creek special with experienced local guides who will point out the unique array of wildlife in the gorge, including the rare black-footed rock wallaby, numerous birds & their nesting sites and a surprising variety of marine life. Enjoy the unique colours of the gorges, learn about the aboriginal & local history, take photos or just enjoy the beautiful natural environment. Why not make YCBT part of your day on the West-Side of the Cape! Tours depart from the jetty at Yardie Creek in the Cape Range National Park. Passengers should have their own transport (Note: YCBT offer a bus transfer service for an additional fee if needed). Please allow 90 minutes if travelling by vehicle from Exmouth (townsite) to Yardie Creek. 11:00am & 12:30pm on operational days. Fees apply for entry into the Cape Range National Park - please contact Department of Biodiversity, Conservation and Attractions (DBCA) for further details. Non-paying children (ie. Infant to 5 years old) are required to sit on an adults lap, unless there are seats available. Minimum numbers apply for boat tours (4 paying passengers). Prior bookings are recommended, due to the distance to travel from Exmouth, however, we still welcome "walk-ons" when we have availability on a tour!